Otter Browser is a cross-platform, free and open-source web browser that aims to recreate aspects of Opera 12.x using Qt framework while keeping seamless integration with users' desktop environments. Otter Browser is licensed under GPLv3. It works on Linux, macOS, and Windows platforms. The Qt WebEngine used by Otter is a wrapper around the Chromium browser core. Following the decision by the board to change focus at Opera Software towards quarterly profits, co-founder Jon von Tetzchner left the company. Opera then announced that it would switch from the Presto layout engine that it had developed to the WebKit rendering engine, also used by Google Chromium project. It later followed Chrome again when it changed to the Blink rendering engine. Around the same time, the Opera community website My Opera was closed down. The new Opera left many of its users disgruntled. Jon von Tetzchner announced a new place for the community that was left without a home by the removal of My Opera, vivaldi.net, which he said would pave the road for a new company, Vivaldi Technologies in 2015 and a new browser, Vivaldi, in 2016 to revive the spirit of the old Opera. At this time, Michał Dutkiewicz also began creating Otter Browser. The first iteration of the browser was released in 2014 - an alpha release in binary form and source code. A notable aspect of the emergent browser is its modular model, making it possible for users to replace components. During early stages of the browser's development, a mail client was already proposed. Planned features include a mail client (as module) and a BitTorrent module. A full list of planned features can be seen here:. ^ "Otter Browser - Browse Files". SourceForge.net. 2018-01-28. Retrieved 2019-01-30. ^ a b "Qt WebEngine Overview". Qt Documentation. The Qt Company. Retrieved 2019-01-30. ^ "Otter browser". Otter browser. 2014-01-02. Retrieved 2016-06-03. 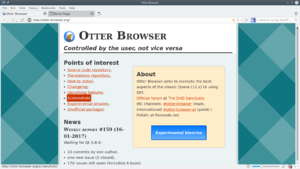 ^ "Opera-Like Otter Web Browser Out In Alpha Form". Phoronix. 2016-06-03. Retrieved 2016-06-03. ^ "Otter Browser Brings Hope To Opera Lovers". itsfoss.com. Retrieved 2019-01-02. ^ Nestor, Marius. "Opera 12 Clone Otter Browser Beta 12 Improves KDE Plasma 5 and Unity Integration". softpedia. Retrieved 2019-03-08. ^ "Otter Browser PPA (release)". launchpad.net. Retrieved 2019-01-02. ^ Wohlscheid, John Paul (2016-06-29). "[Review] Otter Browser Brings Hope To Opera Lovers". It's FOSS. Retrieved 2019-03-08. ^ "Blink-based Opera 15 strikes a sour note with users". IDG. Retrieved 29 July 2013. ^ "Rebuilt Opera Browser Arrives on Desktop With User Backlash". Purch. Retrieved 29 July 2013. ^ "Десятый кандидат в релизы браузера Otter". www.opennet.ru. Retrieved 2019-01-02. ^ a b Brinkmann, Martin (2014). "The Otter browser project aims to recreate the classic Opera web browser - gHacks Tech News". www.ghacks.net. Retrieved 2019-03-08. ^ "Planned features". Otter Browser. 2016-06-03. Retrieved 2016-06-03.